Happy Bloggers Challenge Friday! Thanks to those who played along with the Flowers Challenge, you guys sure do love your flowers, there were so many fabulous entries last week! The challenge this week is Summertime. 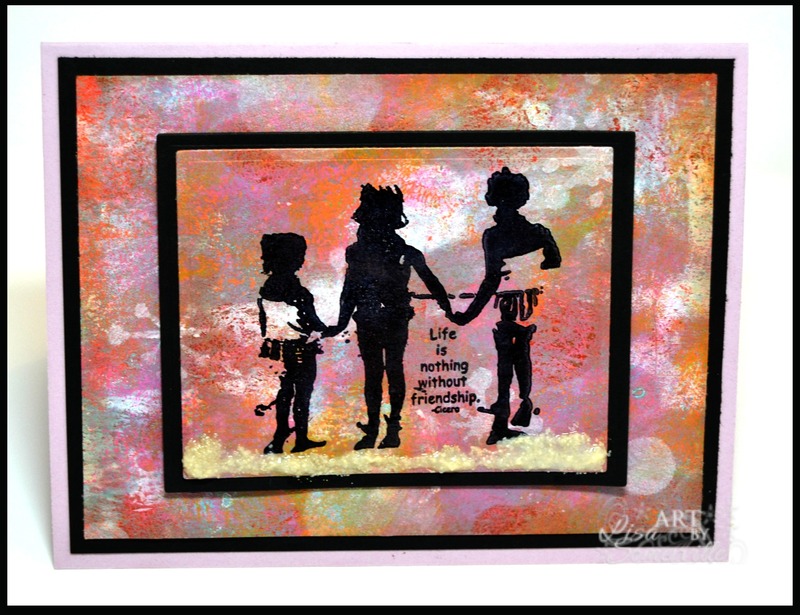 I created a Mixed Media card for the challenge, using the "3 Girls" stamp from Stampotique, DecoArt Paint, the Gelli Arts Plate and stencils from Just a Trace. The mixed media background panel is a result of a number of pulls on top of each other using the Gelli Plate to created a more muted background using the Dottie and Jacks Stencils from Just a Trace, and DecoArt Americana Multi-Surface Satin Acrylic Paint in Flamingo, Coastal Waters and Orange Sherbet, along with some Picket Fence Distress Stain. Once the background panel was dry, I stamped the "3 Girls" image in Ranger Black Archival and die cut the panel and layered it onto a black panel and to the base card using dimensionals. I added a little bit of MuddPuddles Ivory Coast Sand to the stamped panel. If you'd like to play along with this weeks Bloggers Challenge, please link back to this post on your blog and mention you created your card for the Bloggers Challenge Summertime Challenge. Please add your link using the Link Tool below, your link should be a direct link to your Bloggers Challenge Post, use your name as the Title. Please do not link to cards that were created prior to the challenge date. Entries not linking properly, or backlinked will be removed. If you have the captcha enabled on your blog, please consider turning it off, as it makes it so much easier to leave comments. Cant believe its summer already! Beautiful card, just love those colors. Great summer card! Love the sand you added to the image panel. Great background, lovely colours. Thanks for joining us over at Stampotique this week ! Love your creative background, Lisa! The black matting of both the image and card itself is striking! Sweet Stampotique image for your centerpiece! Thanks so much for participating in the Stampotique Designers' Challenge! The background is beautiful and the Stampotique silhouette stamp looks fabulous against it! Thank you for playing along with Stampotique Designers Challenges! Fabulous card Lisa - great to have you playing along with us again.